I am posting a photo a day for the next few days from my visit to River View Cemetery in Portland this past weekend. I thought the location was appropriate because Halloween is upon us! This coming Saturday is 'All Hallows Eve', and in celebration of my favorite time of year, I hope you will enjoy the spooky autumn captures! Lovely Autumn image and scene! Happy Monday, enjoy your new week! Beautiful fall colours, and an appropriate photo subject for the next few days. Ooooh! Me to! I spent a few hours in a cemetery on Saturday...and today's post is from there. I'll have plenty more this week - though I must admit, I seem to have walked away with tons of foliage pics that could have been taken anywhere! The autumn leaves here in this setting are really stunning. Gorgeous shot! 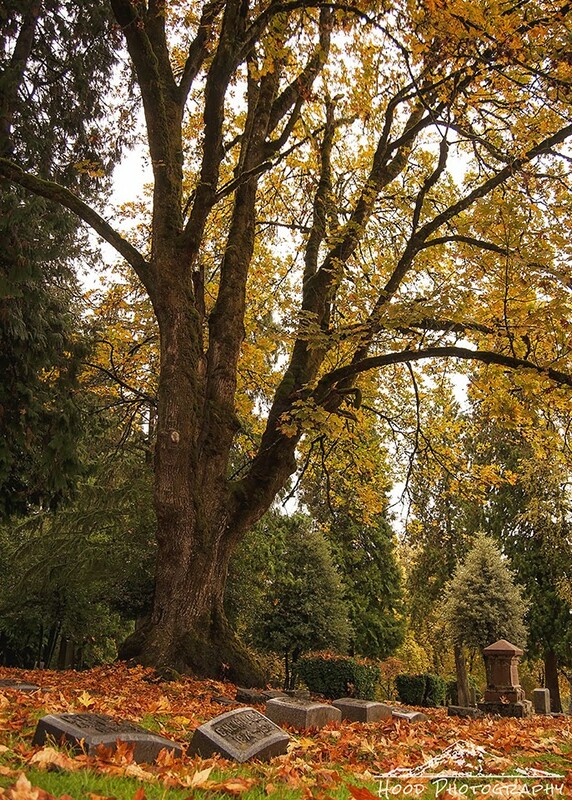 Love the tree, the fall color and the headstones.